I haven’t seen this yet (I’m on the road), but I thought I’d pass it along. 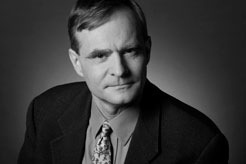 Simon Johnson is the former chief economist of the International Monetary Fund. I don’t know him personally, but from his writings and his past positions, I would guess him to be very much a centrist economist. He presented a very clear and carefully thought account of the nation’s financial crisis on Bill Moyers’ Journal last night. This is well worth everyone’s time. The situation we find ourselves in at this moment, this week, is very strongly reminiscent of the situations we’ve seen many times in other places. But they’re places we don’t like to think of ourselves as being similar to. They’re emerging markets. It’s Russia or Indonesia or a Thailand type situation, or Korea… I have this feeling in my stomach that I felt in much poorer countries, countries that were headed into a really difficult economic situation, when there’s a small group of people who got you into a disaster, who were still powerful, and disaster made them more powerful… Don’t get me wrong — these are fine upstanding citizens who have a certain perspective and a certain kind of interest, and they see the world a certain way… That web of interest is not my interest or your interest or the interest of the taxpayer. It’s the interest, first and foremost, of the financial industry in this country. Next Next post: This plan will not work!